Hunter has been an active supporter of major industry associations for many years. Hunter Employees working with Builders Without Borders in Baja California, Mexico. 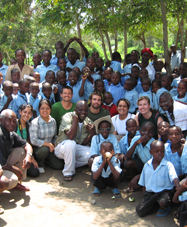 Hunter Employees working with Engineers Without Borders in Mbita, Kenya. Hunter has been an active supporter of major industry associations for many years, and our corporate personnel serve on many boards such as the Irrigation Association. The Hunter sales staff is also very active in statewide associations and legislative groups that support the responsible use of water in landscape and irrigation design. Hunter Industries has long been committed to social action and our employees have established partnerships with United Way, March of Dimes, Habitat for Humanity and other organizations to help them reach their goals. The company also supports educational programs at local community and state colleges in California where our plant is located. As Hunter Industries continues to innovate, we look ahead to another chapter of growth and expansion. Many new products are under development and several will soon be readily available. 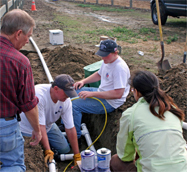 Hunter is dedicated to serving this vital industry with water-efficient irrigation systems and technical services that benefit the professional user and their customers worldwide.